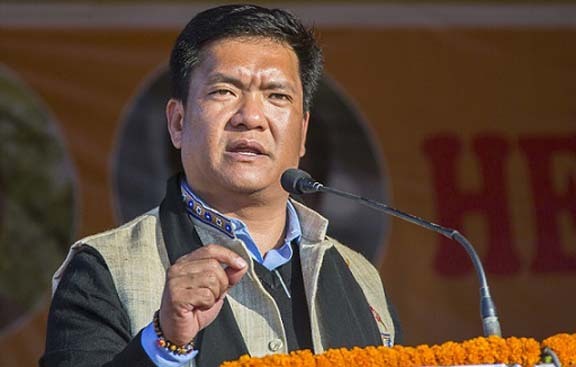 The Arunachal Rising Campaign led by Arunachal Pradesh Chief Minister Pema Khandu on Thursday reached the people of Changlang district. Beginning the day, Chief Minister Khandu paid a visit to the ‘Rangshom Him’ – the prayer house and offered prayers to the almighty ‘Rangfrah’. Interacting with the Rangfrah believers, Khandu assured to develop link road for the prayer house and to provide an ambulance. Following his visit to the ‘Rangshom Him’, the Chief Minister inaugurated the new district secretariat building executed by the PWD. He said the District Secretariat across the State were funded by Centre through SPA but were discontinued. The secretariat building inauguration was followed by visit to the water treatment plant where the chief minister inaugurated the augmentation of water supply to Changlang Township under RIDF (1.5 MLD). “The project will benefit the people of the town with treated water including promotion of additional infrastructure growth,” said Khandu. On his way towards the public meeting venue, the Chief Minister inaugurated the 4.14 km of cement concrete pavement road under Changlang township and the 36 km double-lane Changlang-Margherita road under CRF both executed by the PWD. Launching the Arunachal Rising campaign at a public meeting here, the Chief Minister said Tirap, Changlang and Longding (TCL) districts have in the past face deprivation in Government jobs and in getting centrally funded development schemes due to certain loopholes in the system. Khandu also said centrally-sponsored schemes such as RIDF, NEC and NLCPR are now being massively implemented in the TCL region compared to earlier times when such central schemes hardly reached the region. Giving more fillip to the development aspirations of TCL districts, the CM promised to start the sports academy and Sainik School in the next academic session to begin in 2019. Taking note of the grievances of many APCS aspirants from TCL region of not being able to appear for the mains exam due to commotion during APPSCCE exam, the CM said the matter is in the court and promised to bring the issue of the commission to the coming assembly session for discussion to strengthen and make it more competent. He further said that the State faces shortage of about 70 circle officers and informed that it will be filled through recruitment by APPSC and lateral entry. Responding to public memorandum, the CM said all the demands have been marked to the concerned Secretaries through e platform promising to address it. Some of the demands included creation of new circle headquarters, funds for roads, funds for VKV School, manpower issue of Rangfrah College, posting of Circle Officer and other staffs. Earlier, the CM gave away cash prizes and certificates to winners of essay and painting competition for school children conducted under Arunachal Rising campaign. He also gave away cash prizes and certificates to best ASHA workers, Anganwadi workers and progressive farmers. Beginning his second leg of the day’s Arunachal Rising Campaign, the CM laid the foundation stone for construction of 28 km road from Hukanjuri to Dirok check gate via Namsang-Deomali. He also inaugurated the academic block of the Wangcha Rajkumar Govt College and laid the foundation for piped water supply (2.80MLD) for Deomali Township. Launching the Arunachal Rising Campaign at a public function, the CM lauded the district administration of Tirap for covering more than 20,000 beneficiaries through Sarkar Aapke Dwar.